I probably need to explain what a hog jowl is. Some Northerners have never heard of this cut of pork. It's the "cheek" of the hog. It tastes and cooks similar to thick cut bacon. It's a tough cut that is typically smoked and cured. Hog jowl is used to season beans and peas, or fried and eaten like bacon. Do you know why black-eyed peas are lucky on New Year's Day? As with most superstitions, there are several answers to the question. 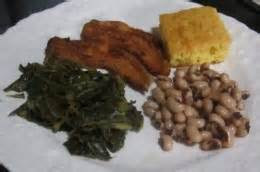 Typically, the belief that black-eyed peas are a lucky New Year's meal is especially popular in the south. Collard greens (or any greens) sub for cabbage in the south because that's what we grow here in the late fall. The southern tradition: each bite of greens you eat is worth $1,000 in the upcoming year. Corn bread represents pocket money or spending money. It's another soul food we eat on New Year's. The tradition stems from the color of the bread. It's color represented "gold" or "coin" money. Plus, it goes well with collard greens, peas and pork. It is said if you eat this meal on New Years day you will have a very prosperous and lucky year ahead! You should try it...you might just make this unique meal part of your New Years Celebration year after year!